The VARTA Silver Dynamic AGM stands for unparalleled performance: with 3 times the cycle life of conventional batteries, the VARTA Silver Dynamic AGM is the perfect choice for vehicles with the highest energy demands. This can be due to heavier usage, cold winters, hot summers or multiple accessories and equipment. That is why you´ll find a VARTA Silver Dynamic AGM in 80% of newly manufactured cars with start-stop technology powered by AGM batteries. Keep in mind: an AGM battery must always be replaced with an AGM. 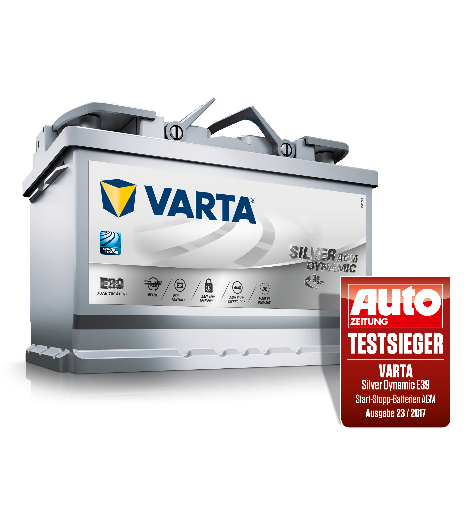 VARTA® recommends change of battery by a professional workshop only.